Tiger Shroff amazed everyone with his debut film ‘Heropanti’ and his next film is titled ‘Baaghi’, which is produced by Sajid Nadiadwala and directed by Sabbir Khan. ‘Baaghi’ is expected to release in April next year. Trade buzz also suggests that Tiger has already started working on yet another film. This is tentatively titled ‘Heer And Ranjha’. He may be romancing Katrina Kaif in this flick. Interestingly, after his debut, jokes on Tiger’s flawless skin complexion which would put even Katrina Kaif to shame and comparing the duo further went viral. Rumor mills are abuzz with talks that Tiger may also romance Jacqueline Fernandez in a separate flick directed by Remo D’Souza. With so many films in his kitty supposedly, all in the industry are now confused if ‘Baaghi’ and ‘Heer And Ranjha’ are the same film with reworking on its title or they are different. There’s also no official word for the Remo film which is to go on the floors soon. Guess the relative newbie is enjoying all this attention while it lasts. 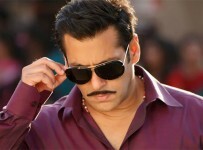 Salman, Prabhu Dheva in Dabangg 3?